It’s been two and half month since our event at New York city with the Class of 2018 and we so much miss the impact that we made then and we are still making. The Most Influential People from all over the world came prepared, connected with their peers and got trained by one of the leading organization specialized in self-development with respect to Leadership. The honorees present were taken on a 3days journey of self-awareness with a focus on how to be better leaders in their sphere of expertise. 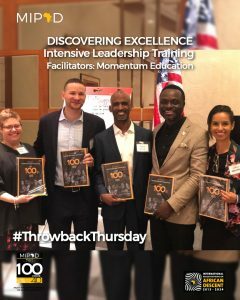 It is was a time we won’t forget in a heartbeat and we are excited to announce to the public that come 2019, they will be in charge of training the honorees on leadership development who make the global list. Momentum Education is honored to have collaborated with MIPAD this year for the 2018 Recognition Week in NYC. After delivering an impactful Discovering Excellence Training to the 2018 Honorees, we are eager to extend our trainings to the MIPAD community abroad. We know that true transformation occurs in relationship, and the way to create a Win-Win World (and Win-Win Africa) is through meaningful partnership with YOU! Come 2019, they are offering to give a discount to Class of 2019 who will want to take part in any of their training session which includes Leadership Development, Effective Communication, Team Building, and Diversity & Equity valued at (398 dollars) only if you use the CODE: MIPAD2019. We are excited about this partnership and cheers to the future of AFRICA.